This week we will be checking out a another prehistoric shark. Lets look at Squalicorax! Squalicorax was a shark that lived in the oceans that once covered North America, Europe, and Northern Africa. There were four species of Squalicorax sharks, which between all of them, lived between roughly 84 and 68 million years ago. Growing up to over sixteen feet long from snout to tail, Squalicorax would be considered a large shark, and a top predator in today's oceans. However, Squalicorax would have shared space with a myriad of other enormous marine animals, including giant marine lizard, Tylosaurus, which was possibly its predator. The name, Squalicorax, translates to "Raven Shark". I hypothesize this is due to the fact that there is strong fossil evidence of Squalicorax being a scavenger in life, and ravens are also known scavengers in their ecosystems on land. (Although I cannot for the life of me find anything explaining the etymology on this animal. If anyone reading this knows better and has a source, please let me know so I can fix it.) Like all sharks, Squalicorax was a meat-eater. 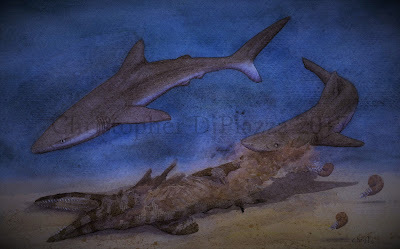 Two Squalicorax falcatus feast on the remains of a dead juvenile Tylosaurus. Squalicorax would have looked like a modern Gray Reef Shark, or possibly a Great White Shark, at a glance when alive. It had a streamlined body, long triangular pectoral fins, and a tall dorsal fin. However, its teeth were more similar to those of a modern Tiger Shark's, being shallow, finely serrated, and slightly curved to the side. This means Squalicorax was adapted to cutting and gnawing at its food, an adaptation seen in sharks that frequently scavenge. This is backed up by the fact that Squalicorax teeth marks have been found in the bones of other animals that would have been too large for it to have hunted. Even entire Squalicorax teeth have been found embedded in some of these bones. Fossil animals that this shark scavenged from include turtles, large fish, mosasaurs, and even a duck-billed dinosaur, which had probably died in a riverbed and washed out to sea. Of course, there is no reason to assume Squalicorax only scavenged and never hunted live prey, too. Most modern sharks, including all the species Squalicorax shares resemblance with, will hunt or scavenge depending on what food is available to them. Squalicorax tooth, note how short and wide it is and the serrations. When the shark bit into something and turned its head from side to side, these teeth would act like a saw to cut pieces of meat into bite-sized chunks. Sharks, as you may already know, possess a skeleton that is almost entirely made of cartilage. This soft tissue does not preserve well and hardly ever fossilizes. 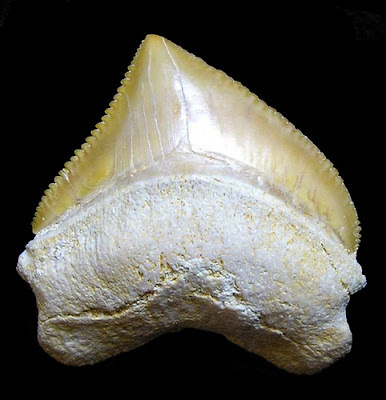 Because of this, many prehistoric sharks are only known from teeth and jaws, leading experts to only hypothesize as to what they looked like by comparing their teeth to those of modern sharks. Not the case with Squalicorax! A wonderfully preserved fossil from this shark was unearthed in what is now Kansas that includes a fully fossilized head, spine, and pectoral fins! Wonderfully preserved Squalicorax skeleton on display at the National Musuem in Washington D.C.
That is all for this week! As always leave comments below! Special thanks to paleontologist, Nathan VanVranken for his insight during the making of this article and life reconstruction above. This week we will be checking out a unique plated dinosaur. Enter Miragaia longicollum. Miragaia was a plant-eating dinosaur that lived in what is now Portugal during the Late Jurassic Period, about 150 million years ago. From beak to tail it measured roughly twenty feet based on the skeleton material that has been found. The genus name is in honor of the village of Miragaia, near where its bones were first uncovered. However, "Miragaia" also translates to "wonderful Gaia". Gaia, in Greek mythology, was the titan of the earth, and mother to many of the gods. The species name, longicollum, translates to "long neck" for reasons that don't need explaining once you see what this dinosaur looks like. My Miragaia life reconstruction in watercolors. Long necks are nothing new or unusual for dinosaurs. Sauropods, being the most famous for having them, as well as many theropods, including lots of living birds! Miragaia, however, was none of those things. Miragaia was a stegosaurid, a close relative to the more famous, Stegosaurus. Among stegosaurids, Miragaia had a noticeably long neck, which consisted of seventeen vertebrae. Stegosaurids, in general tended to have relatively long-ish necks, consisting of between nine and thirteen vertebrae (depending on the species) possibly to help them access as much low-growing vegetation as possible without having to move their bodies while feeding. The specific reason why Miragaia's neck was as long as it was is still somewhat of a mystery. What's even more interesting is the fact that since it lived during the late Jurassic, Miragaia was coexisting with sauropods, which also had extremely long necks. Perhaps it was evolving to compete with its sauropod neighbors? Keep in mind, despite being quadropedal, Miragaia was probably able to rear up on its hind legs for short periods of time, perhaps to reach higher vegetation while feeding. This is because, if it was anything like more completely known stegosaurids, its center of gravity would have been in its hips, making its front end much lighter. Maybe it's neck allowed it to feed in a space just below the larger sauropods, but beyond other stegosaurids? We may never know for certain. Miragaia is an interesting find because it was not discovered by paleontologists looking for fossils. Its remains were found on accident by construction workers, while building a road. Because of this, only the front half of Miragaia's skeleton was found, the back part unknowingly may have been destroyed during the construction. Going off the front half, however, there are a number of interesting things to note about this dinosaur other than the neck. Part of Miragaia's skull was preserved, including the beak. Miragaia's beak was relatively small, but flared out slightly on either side, making an almost upside-down heart shape. This beak was likely ideal for clipping vegetation to be processed by the small teeth farther back in the mouth. Photograph of most of Miragaia's bones that are on the fossil record. Photo credit: Dr. Mateus. 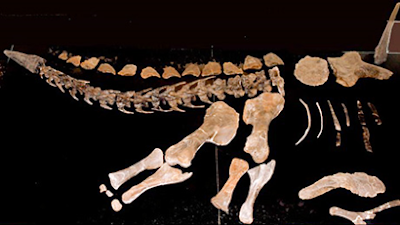 Miragaia had bony plates on its back, just like all known stegosaurids. These plates (at least the ones that were found) were relatively small, and were arranged in pairs, like those of its relative, Kentrosaurus. The plates may have been for display between members of the species. They also might have had a roll in temperature regulation or even could have helped with camouflage by obscuring the animal's profile, depending on what kind of environment it was in. Many living reptiles have similar adaptations today, like spines and sails for those purposes. Stegosaurids are also known for having spikes, usually, but not limited to the tail. 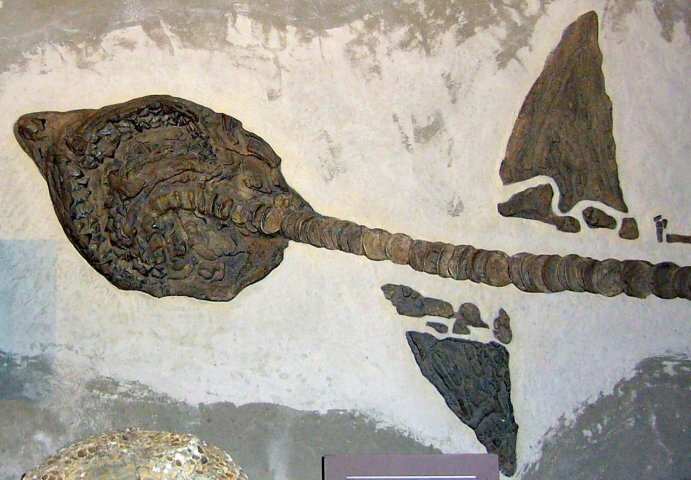 One fossilized spike was found in association with Miragaia that was hypothesized to have been on the tail in life. Unfortunately, because the back half of Miragaia was never found, whether or not it had more spikes, like Kentrosaurus, or more plates, like Stegosaurus, is still uncertain. Because of this, life reconstructions of Miragaia (that include the animal's rear) can vary and still all be considered as accurate as possible. That being said when I was consulting with paleontologist and stegosaurid expert, Heinrich Mallison, about painting Miragaia, he half-jokingly suggested that if I really wanted my reconstruction to be accurate, I'd paint a dead individual with its back end eaten away by scavengers! There. Accurate. And yes, that Torvosaurus totally ate all the tail spikes too. Mateus, O.; Maidment, S. C.R. ; Christiansen, N. A. (2009). "A new long-necked 'sauropod-mimic' stegosaur and the evolution of the plated dinosaurs". Proceedings of the Royal Society B: Biological Sciences. 276 (1663): 1815–21. Waskow, Katja; Mateus, Octavio (2017). "Dorsal rib histology of dinosaurs and a crocodylomorph from western Portugal: Skeletochronological implications on age determination and life history traits". Comptes Rendus Palevol.